The RAP is an army term for Regimental Aid Post, [ where you go to get aid ]. The RAP came about in the early days when a few of the boys would wait ''up the road'' to welcome and direct newcomers to the camp sites. Over time it became tradition that the waiting place should be in the shade and a chair made life a bit easier, and so it began that most people ''IN'' camp would go to the RAP to ''help'' everybody and wait for newcomers. 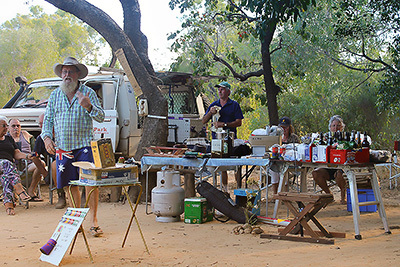 A tradition was born…the RAP is now part of PANDANUS PARK'S social life. Those who wish, gather at the RAP at 4.00pm, or earlier to exchange information and to be updated on activities to come in the near future. 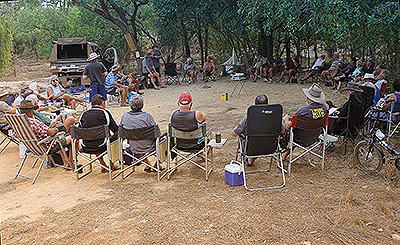 A few beers, a chair, mates, new found friends and old, plus a heap of laughs, just for a couple of hours a day in the cool of the afternoon kicking back. The Pandanus Cross is awarded each day ''in jest'' for the biggest 'stuff up' of the last 24 hours.. e.g. bogging a vehicle, forgetting to turn the fuel 'on' on the generator, dropping a barra, forgetting your chair and worst of all turning up to the RAP with out your drinks. It's just good humour and ads to the atmosphere. Beware of ya mates… they will dob you in! The fishing and camp stories flow freely. Who caught that '' BIG BARRA'' today? Did ya see that croc at SHADY CAMP? 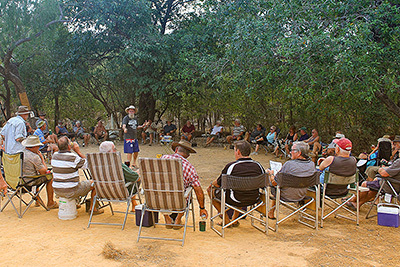 A few of us had a bbq at Jacks Creek, let's do that again. And so the days end, we will do it all again tomorrow. By about 5.30pm to 6.00pm most start to drift off to their various camps as many have meals cooking in camp ovens or cobb ovens. This is called ''chair clacking time '' as the couples go and the single people stay a little longer . ENJOY THE MATESHIP AND LAUGHS!